Manarola, Italy is one of five tiny towns in a section of the Italian Riviera known as Cinque Terre. 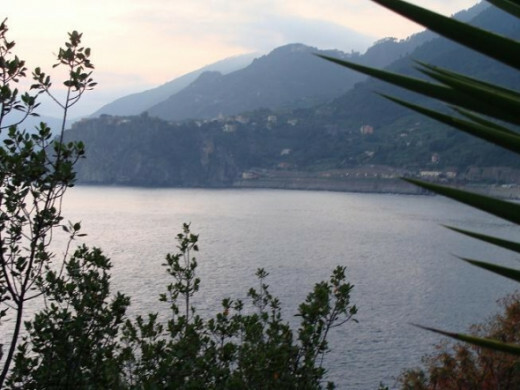 Although Cinque Terre translates to "five lands," it actually refers to five villages that are all connected by a walking path: Monterosso al Mare, Vernazza, Corniglia, Manarola, and Riomaggiore. My family had the honor of being able to visit Manarola in June of 2008. It was an experience we'll never forget. Would you like to hear about our trip to Manarola and view some of our photos? 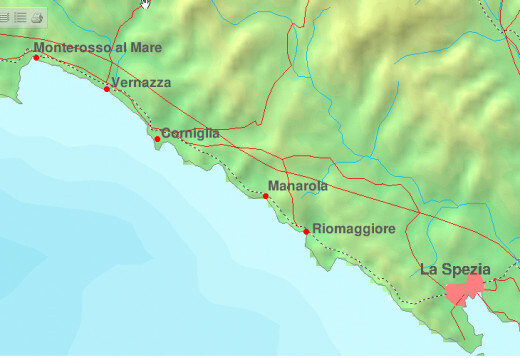 This is a map that shows the five villages in Cinque Terre: Monterosso al Mare, Vernazza, Corniglia, Manarola, and Riomaggiore. Each of the five villages has it's own unique personality. We would have loved to have explored them all, but did want to see some of the rest of Europe too! Cinque Terre is located along the Mediterranean in Northern Italy. Cinque Terre can be found at the chocolate brown area on this map. Venice,on the other hand, can be found in Northern Italy on the other side of the "leg" that makes up Italy. Draw a line straight across the top of the "boot" from Cinque Terre, and that's Venice! How Interesting and Unique the Colorful Buildings in Manarola Are! 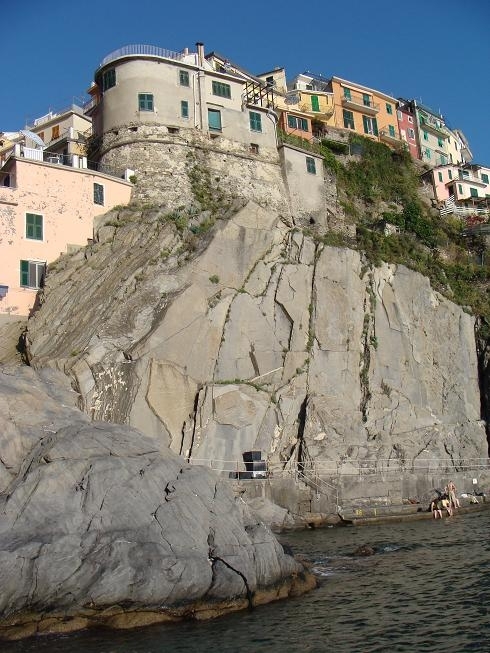 - Some of the buildings in Manarola are built right into the cliff! One of the things that fascinates me about Manarola, Italy is the colorful buildings built on the side of the cliff! Look at how they are almost stacked on top of each other! They are called "Tower Houses." Notice how the pink building in the lower right hand side of the photo is build right into the cliff! There are plenty of boats, yes. But notice anything missing? Where are the cars? 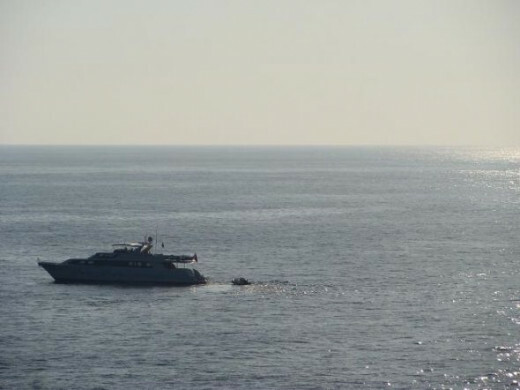 How do you get to Manarola? One of the things that makes Cinque Terre unique is it's absence of cars. For our entire stay in Manarola, the only vehicle we saw on the roads was a shuttle bus that carried people from the parking area to the center of the village. There is a train that connects the five villages, and that's how we got to Manarola. After getting there, we walked every where we went. The hills are steep, but it's so wonderful to have that freedom from cars! No traffic lights. No horns going beep! No screeching of tires or car accidents or traffic violations. Yes, you can drive there if you'd like, but you must park your car outside Manarola and either use the shuttle bus or walk into the village on foot. Apparently those few residents who have a car park it somewhere (although we never saw any of their cars), but unless you are a resident, you must have a load/unload permit to bring a car into the village. Other options for getting there include by foot or ferry boat. A walking trail connects the five villages. The trail runs along the coastline of the Mediterranean Sea. Do you see it above? It runs across the middle of the photo. 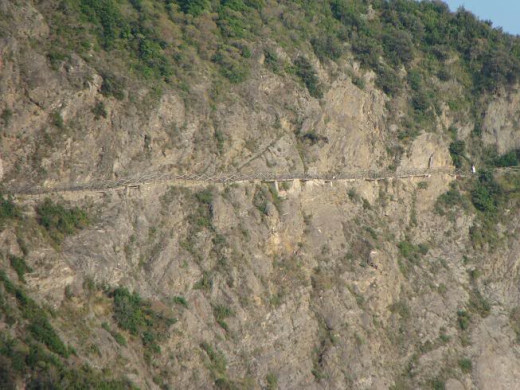 My family walked the trail from Manarola to Riomaggiore (that part of the trail is called Via dell'Amore, which means Love's Trail, or Love's Way or Lover's Lane) as well as part of the trail between Manarola and Corniglia. The views are absolutely incredible! There is a small charge for walking the trail between some of the villages, but not between others. 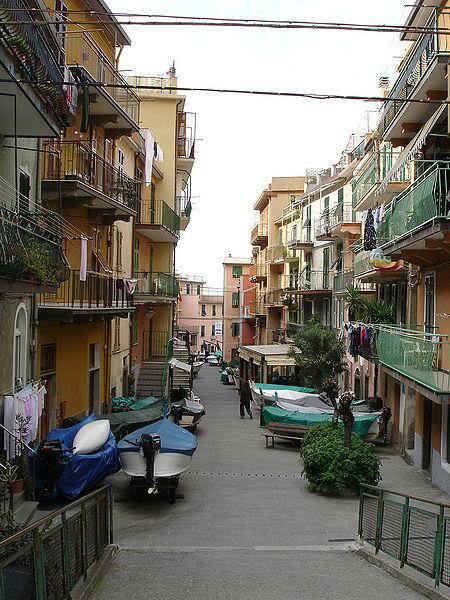 We took this photo of Riomaggiore, a neighboring village in Cinque Terre, as we walked along the trail. Be sure and check out the photo gallery below for some more of the photos we took along the trail! Scenes from the trail - We took these photos as we walked along the trail between Manarola and neighboring villages. We stayed in a youth hostel on the top of the hill at Manarola. It was a hike up there, as you're climbing almost constantly on the way up. And the hostel isn't exactly a Hilton Hotel once you get there, yet it certainly met our needs and was clean and inexpensive! We enjoyed our stay there very much and do recommend it! If staying in a hostel every now and then allows your stay in Europe to be longer, go for it!! There's no pool, but hey, you've got the Mediterranean Sea to swim in!! Who needs a pool!! There were five of us along, so we reserved a room that had six bunks in it. No one else stayed in that room except us (unlike when we were sound asleep on a night train between Venice and Munich - as sound asleep as you can get on a little tiny bunk bed on a moving train, that is - and someone came into our very small train cabin and climbed into the one empty bed around 2 in the morning!). Our Hostel room had it's own (clean) bathroom and shower for which you use shower coins. Lockers were provided in the room for storing your belongings. Although the lockers might not be necessary if you've reserved the whole room just for your party, they are certainly nice to have if you're sharing a room with others you don't know! In addition to the six bunk rooms, they also have twin and quad rooms available, also with a private bathroom and shower. Where to eat in Manarola, Italy! A small restaurant, Pasta pesto & Co. Restaurant, is available in the hostel for breakfast and dinner, but the hostel is closed during the day so you'll have to eat elsewhere for lunch. Not to worry! There are some great restaurants in Manarola! Most of the ones we found are down near the waterfront. 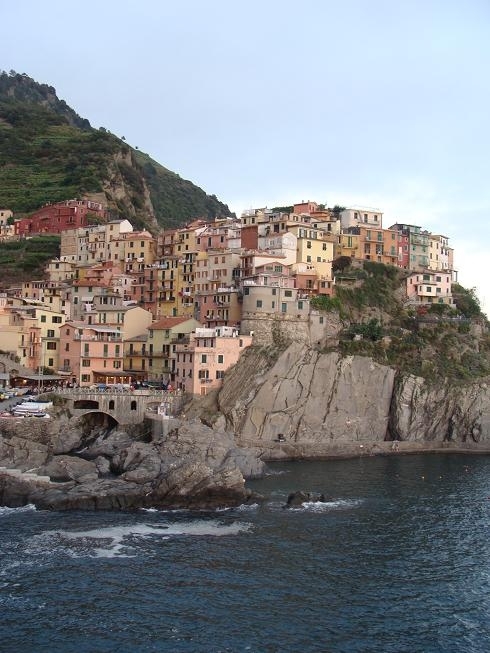 This link takes you to a site of reviews of restaurants in Manarola. If you're staying several nights in Manarola, it might be fun to walk over to Riomaggiore, Italy one evening and dine in one of their many restaurants! Manarola is the oldest, yet the second smallest, of the villages in Cinque Terre. The church, San Lorenzo, dates back to 1338! The local dialect is Manarolese. Romantic Weekends in Europe - This book has a section on Cinque Terre. In addition to a section on Cinque Terre, it also features Salzburg, Austria; Zermatt, Switzerland; Porto-Vecchio, Corsica; Paris, France; Venice, Italy; Amsterdam, Netherlands; London, England; Copenhagen, Denmark; Geneva, Switzerland; Madrid, Spain; Galway, Ireland; Bruges, Belgium; Lucerne, Switzerland; and Vienna, Austria. For each European location, recommended hotels and restaurants are suggested. Also provided are ideas for romantic activities and experiences, such as exploring the tulip fields of Amsterdam by bike, taking a boat ride on the Danube, and visiting some ancient ruins in Budapest at night. Speaking of swimming in the Mediterranean Sea - oh man! What an experience! 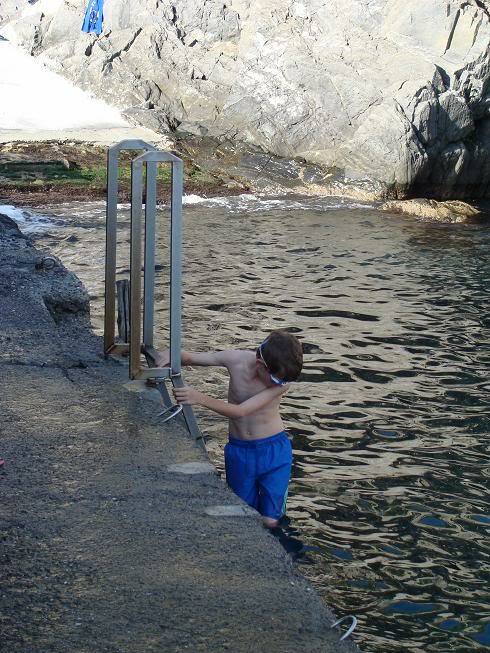 A ladder is provided, but the water's so cold, most of our family found it easier to just jump right in. You go numb within just a minute or two and then don't have to worry about the cold! The swimming area is nestled in this little cove, although it certainly seems bigger when you're in it than it appears in this photo! Visiting Manarola is like visiting paradise.... - It is soooo beautiful! And without the cars, everything is calm, peaceful, quiet, and relaxing. Do you agree? 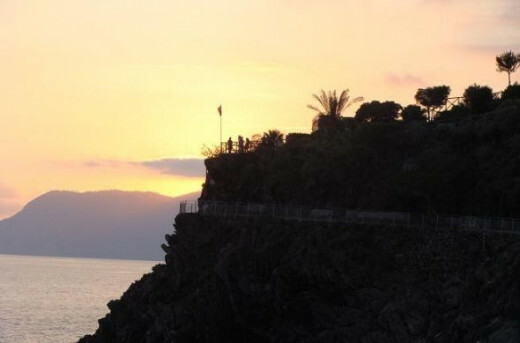 After viewing the photos above, do you feel visiting Manarola would be like visiting paradise? Would you like to visit Manarola? Yes, I'd so love to visit Manarola! It's gorgeous! It's okay, but I could take it or leave it. No, Manarola doesn't look that great to me. I've been before and loved it! Guide Books On Italy - They're worth the expense! Prior to, as well as during, our vacation in Europe, our personal favorite travel guide was the Rick Steve's series of guide books, although we used several others as well and they all had something to offer! We found that Rick Steve never steered us wrong. We found his advice and recommendations to be helpful and always very accurate. This one has lots of color photographs too! It also contains a little Italian history, so the places you go will be more meaningful to you! As the title suggests, this one is full of color photographs as well! If not, would you like to go? Yes, I live in Italy! Yes, I've been to Italy! No, I've never been to Italy, but I hope to go some day! I'm not much of a traveller. It's home sweet home for me! 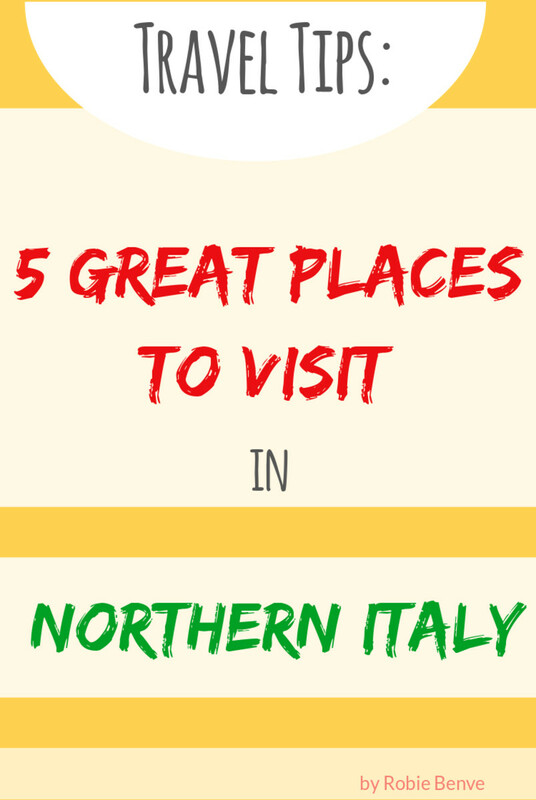 100 Places in Italy Every Woman Should Go - This is not your typical travel guide book! This book covers the not-to-be-missed churches, temples and other holy locations of Italy, gardens, beaches, great shopping opportunities, spas, restaurants, activities (hiking, skiing, biking, boating, yoga), cooking classes, arts and crafts (leathercraft, jewelry making, maskmaking, landscape painting, mosaics, ceramics), opera, classical music, jazz, puppet shows, child-friendly locations, and more! This book covers the "off-the-beaten-path" places to visit while on your trip to Italy! These are the places you might never have heard of, but will love experiencing! This book pairs well with one of Rick Steve's travel guides. 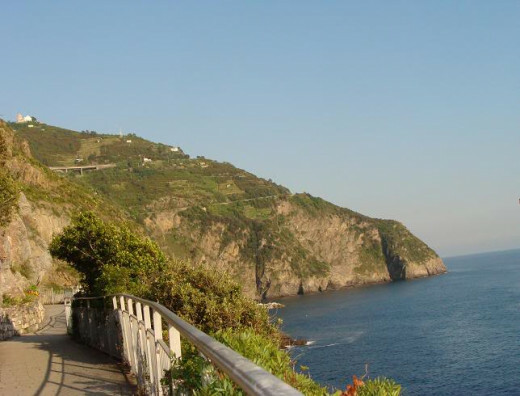 Want to See Some Of the Other Towns in Cinque Terre? 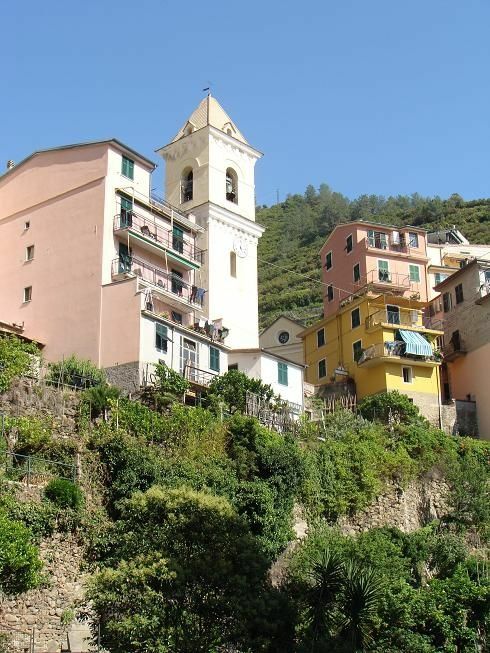 - Are you trying to decide which village in Cinque Terre you'd like to visit? Don't miss the beautiful photos that can be found on these sites!! 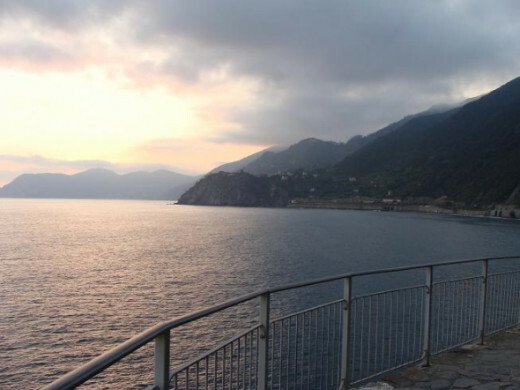 Here's an article about Cinque Terre. 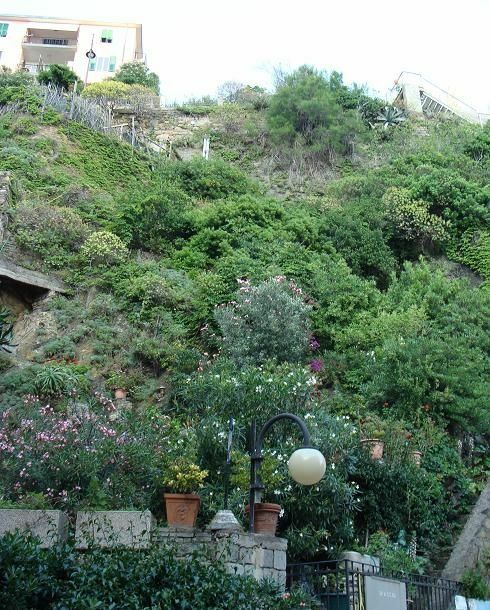 Scroll down to the bottom and you can see some beautiful photos of all five villages in Cinque Terre! 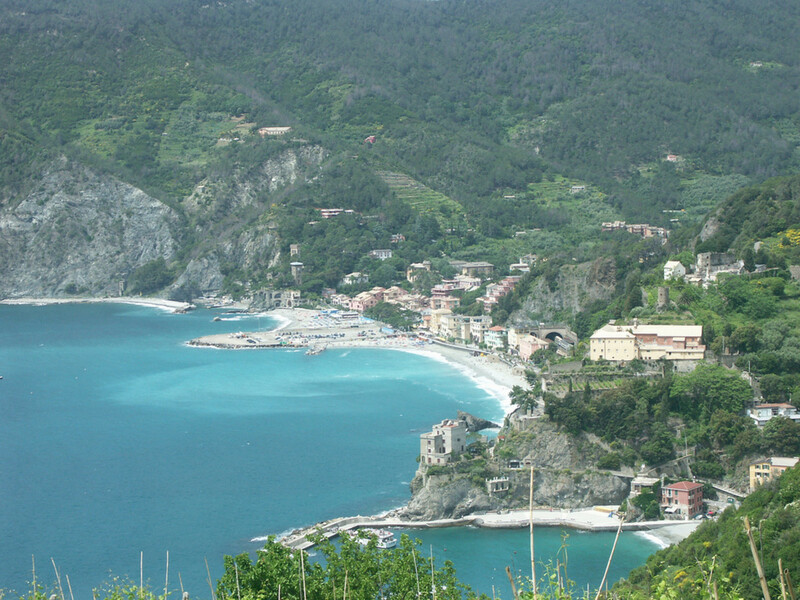 This is an article specifically about Monterosso al Mare. Don't miss the photos of Vernazza at the bottom of this site! 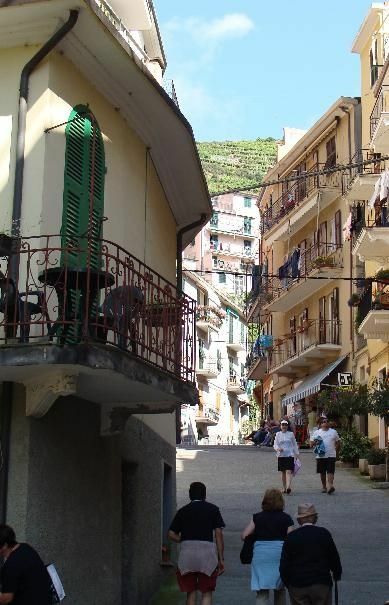 Corniglia is the middle village of the five that make up Cinque Terre. Beautiful photos can be found on this site as well! 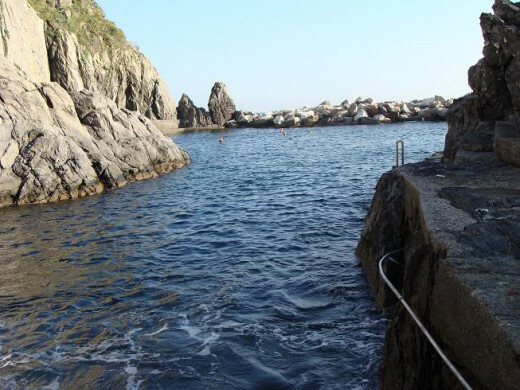 Did you know that the mountainside and water near Riomaggiore have been declared national parks? Be sure and look at the gorgeous photos on this site! 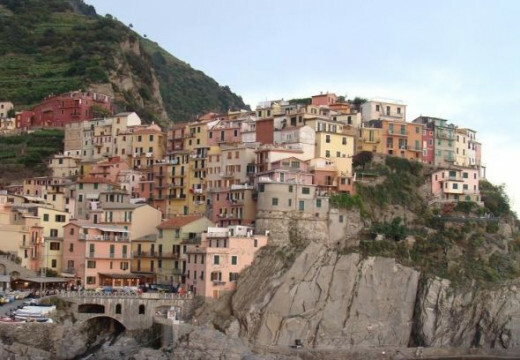 More Information About Manarola - To Help You Plan A Trip Of Your Own! 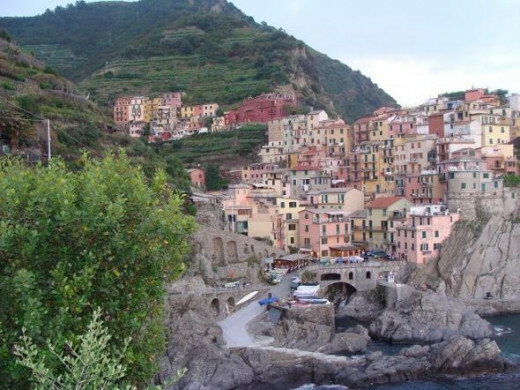 This is an informative site about visiting Manarola. 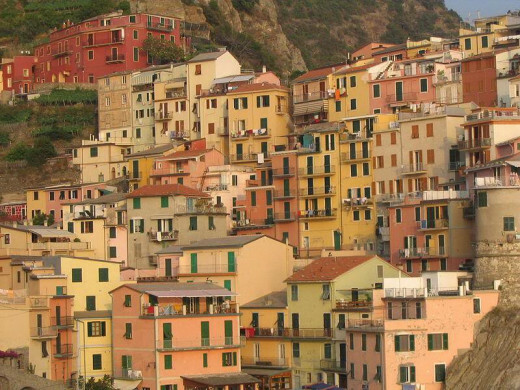 This is a very short article, with a large, colorful photo of Manarola. 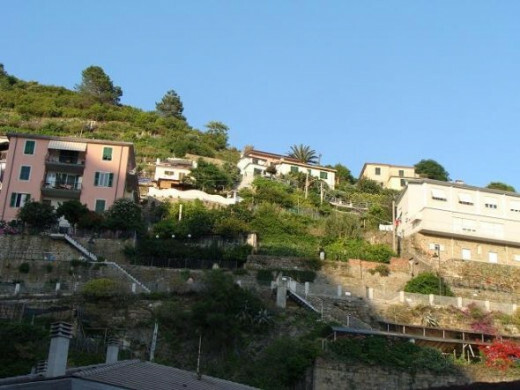 This site offers a webcam of Manarola, in addition to some interesting information about the village. Manarola, Italy Jigsaw puzzle - Bring a little of Manarola right into your living room! This Cinque Terre puzzle was made in Italy. It has 500 pieces and measures 19 1/3" x 14 1/5"
Have You Ever Been To Manarola? Yes, we've been to Manarola several times. Yes, we vacation in Manarola every year. No, but I'm planning a trip to Manarola. No, but I'd really love to go! I love this piece of art! 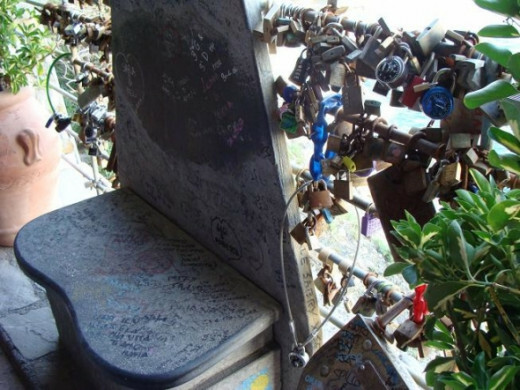 It's both charming and romantic, just like Manarola! It's quite timely that I come across this hub. I'm travelling to Italy next month and we're planning to visit Cinque Terre. 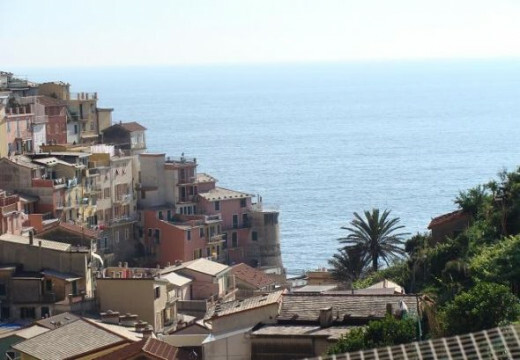 We wanted to stay in Manarola or Riomaggiore but prices are too high for what little accommodation there is so we're staying in La Spezia and visiting Manarola by train. I am from Italy - Genova. But I have a flat in La Spezia now. I was in Manarola this Easter -but unfortunately the walks were all closed because heavy rain during the winter made them unsafe -shame but it is such a beautiful place. great village with amazing beauty.. wish to visit it. Love your lens. 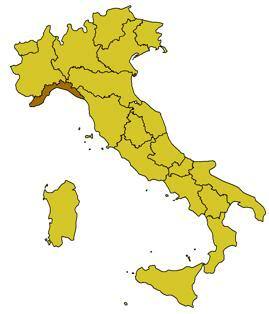 I actually come from La Spezia, main town in the province. Love all of 5 terre and go there on holiday every year (I live in England now). Great pictures that brought back great memories! Well done!!!!! great squidoo lens...would love to visit Italy..
Oh yeah, been there. I hiked between all of those towns and swam in the ocean very awesome. Manarola is now (after reading your lens) on my list of places to go to! I am planning a trip, and appreciate the information on this lens. Thank you. Beautiful in one word, I'll surely try to visit this place once in my life. I saw a travelogue on tv about this area and always thought I'd like to live there for a couple of months. It just seems so peaceful and friendly. I really enjoyed this lens. Looks neat! I'd love to go! Nice lens! After visiting this lens Manarola has been added in my bucket list for tour. Could any place on earth be more lovely? I don't just want to visit, I want to live there. Beautiful photos. I say we all have a meet up in Cinque Terre! "Squid Angel blessed." It does look like a great place to be able to visit. Italy is a good country to visit with lots of exciting things to see and do. Manarola looks great - I shall add it to my bucket list. Manarola is really wonderful, nicely depicted in your lens. I've always passed by, unfortunately. 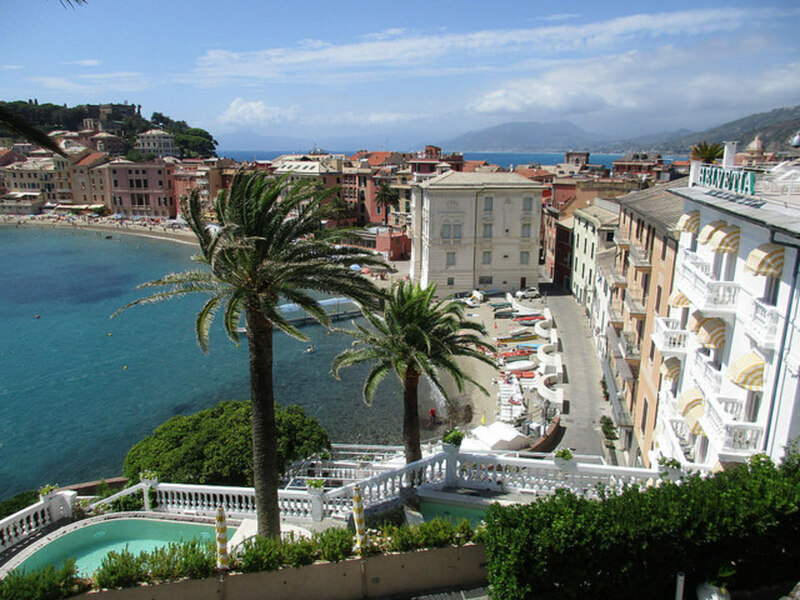 My sons live in the south of France nd from there I go to Italy, usually one of the larger cities. Wow, Italy has some absolutely breath-taking scenery! Fantastic and well put together lens! I hope I get a chance to visit one day! Amazing, I hope to visit Italy soon too! I love this lens!! Manarola is definitely on my bucket list! Beautiful lens! I think I'll have to add this to my travels next time I visit Italy. 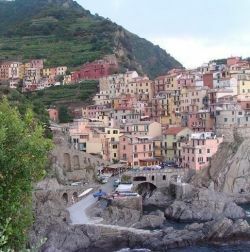 I have heard about "Cinque Terre" from friends that they have visited, but i haven't ever imagine that is so beautiful! Thanks for this Lens! Ohhhh, I love Italy! This lens make me want to go back there! BEAUTIFUL! When can I leave here for there? Lol. Oh, and I especially love the vegetarian recipes! I love the way the building look like they've grown out of the cliff. What a beautiful place! Oh I so wanna go to Manarola, Italy too. TY for the virtual view from here at my desk in SW Washington. I love these virtual tour lenses. Now I don't feel left out by not being able to see the world. It sounds like swimming in the Mediterranean is a lot like swimming in Lake Superior! Beautiful photos of a beautiful area. What a beautiful city to visit! It is going on my list!! Manarola, Italy is fascinating! Your photos of your trip give such a gorgeous view of the city and neighboring area. I add my blessings and a bit o' sunshine to beautiful Manarola. What a beautiful place! Thank you for sharing your experience of your visit. I haven't been to the Italian Riviera, however this lens makes it very enticing. This looks like an amazing place to visit, and you did it proud with this splendid lens. Great job, blessed and congratulations on your Purple Star award. Thanks for introducing such an enchanting and beautiful place! What a great lens about one of the most beautiful parts of the world. You did a fantastic job! Loved the pictures...they definitely got me in the mood for all the recipes you posted! I was just here in January but wanted to stop by and congratulate you on front page honors for your beautiful presentation of Manarola, Italy...a trip of dreams come true and many smiles! Beautiful place! Thanks for sharing it! 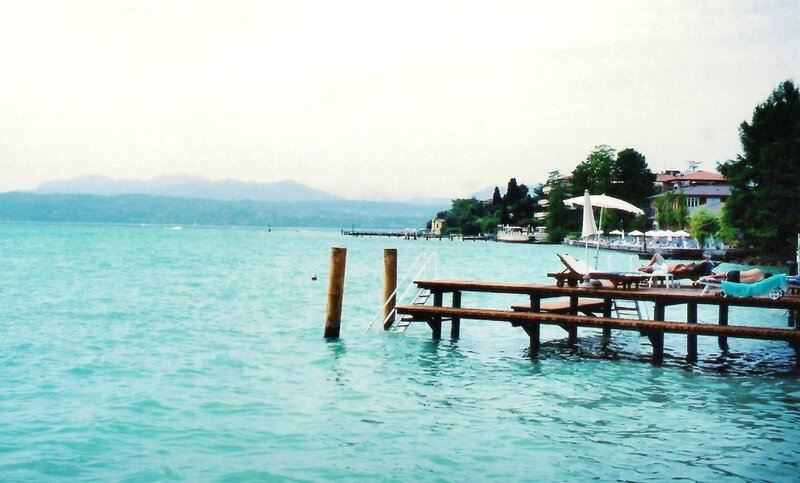 Italy is the top of my list in my dream vacations. Beautiful lens. Thank you for sharing! Absolutely gorgeous! You've created a beautiful lens here and I thank you for sharing your experience. Angel Blessed! Absolutely stunning. This has just made the list of my places to go. I shall include Manarola in my travel list, from the photos, I can feel that it is really natural and I like it when there are no vehicles on the road, the air should be really fresh. Thank you for sharing. Gorgeous photos! The Mediterranean really has some of the most beautiful towns and cities in the world, doesn't it? Terrific! What a neat place. I love the idea of NO CARS!!! I enjoyed your lens! The place is beautiful. I love those old towns. Been to Venice, but would love to see more of what Italy has to offer. Thanks.. Words can not describe its beauty, what a wonderful land! What a beautiful place, I'd love to visit it, here's a *angel blessing* for the great article. Looks like a great place to visit, relatively close to where i live too, will have to visit Manarola sometime soon! Great lens! Loved Italy! Such a beautiful country. What a stunning place! Love the photos! Thank you for sharing this little slice of paradise! This is like a world of it's very own. Very unique. Thank you for sharing your experience! 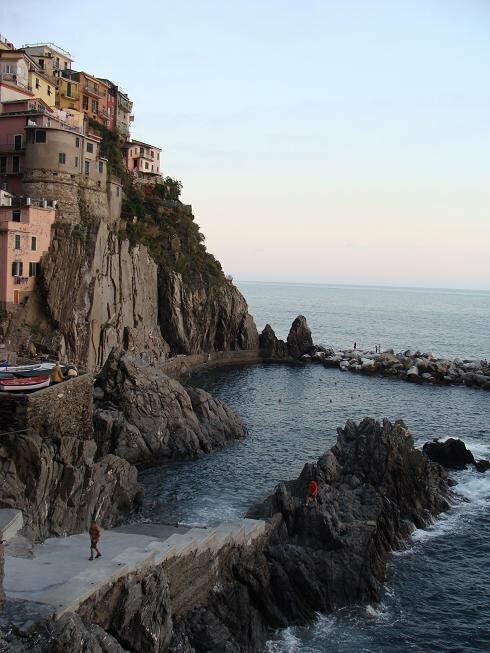 Returning to enjoy your delightful trip to Manarola once again, what a treat! This is a fantastic looking place..just beautiful. You really gave it justice with this lens. Manarola, Italy looks so beautiful. I enjoyed visiting through this page. So beautiful! I would love to visit and swim there! Have been trying to decide if this is somewhere my family would enjoying visiting in Italy. You help me decide YES!!!! THX! Beautiful lens with awesome photos! I so want to go now! Beautiful! I sure hope those walking trails have rails! Great lens! I really liked the photos! Beautiful photography and great tips. 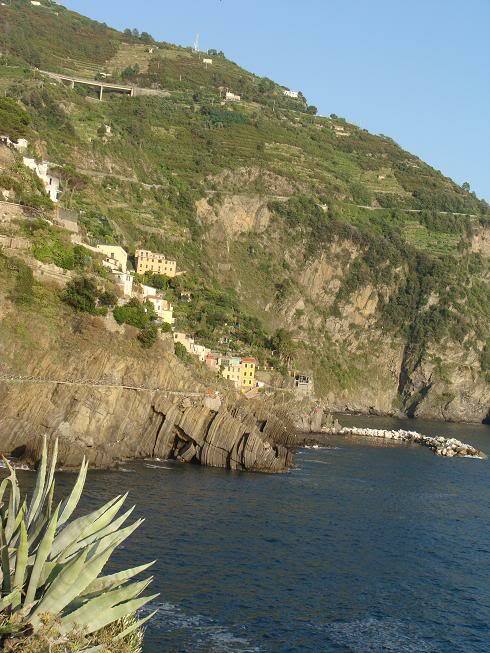 I have hiked in other places in Italy but would love to do so in Cinque Terre. Blessed. I love the small towns in the area where fishermen still bring their catch in. Beautiful lens - I loved the photographs and the details about this unique destination in Italy! Some beautiful photography here - bella! Makes me dream of going back to Italy! I have not been to this part of Italy- yet! It looks so nice and peaceful. Lensrolled it to my lenses on The other side of Rome! Wonderful lens, Fantastic photos. 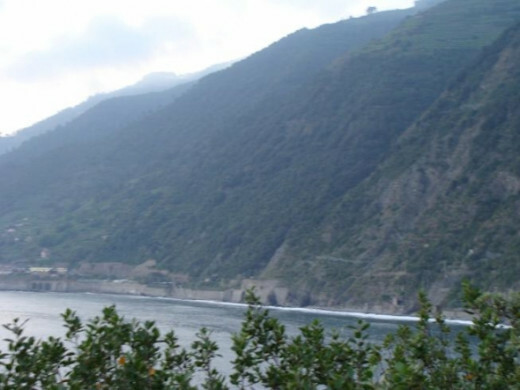 While I had heard of Cinque Terre, I never really know anything about them. So thank you for a very informative and interesting lens. Blessed by the western europe angel. Wow! I want to go to Italy! That swimming hole is cool but sounds cold! Brrr! Love your pictures! great lens!beautiful pictures..i could only afford to dream the places..